Jaipur is a beautiful city during the day, yet it is even more beautiful at night (Jaipur night Tour). Jaipur Night Safari: The vibrant colors of the city keep alive the 300 year old architecture and culture that Mughals bestowed upon India. Visit the city in the evening and explore the antiquity of various monuments. Also enjoy delicious dinner at a local restaurant while watching a folk dance performance. Jaipur, the legendary city of Rajasthan is an epitome of heritage and royal legacy. Jaipur is a beautiful city during the day, yet it is even more beautiful at night (Jaipur night Tour). 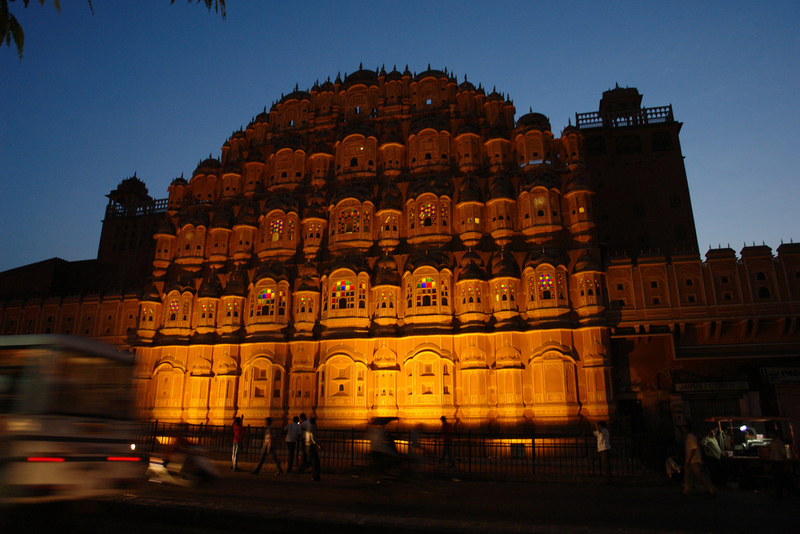 The monuments, places and old streets can be experienced best at night tour of Jaipur. Although the monuments are closed, you can still appreciate them from outside, get to know about the different small roads and enjoy the beautiful night views of the Jaipur city. 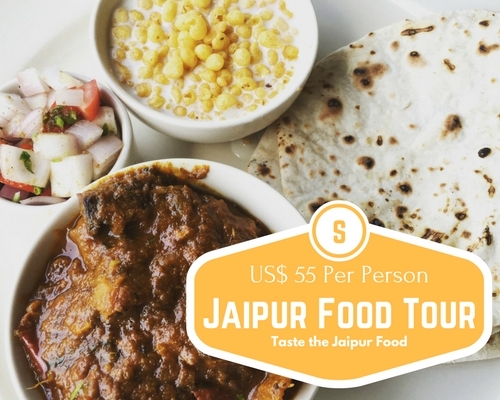 Per person Cost: US$ 30 Per Person. Approximate Picking Time (Winters): 04:00 PM October 01 to March 31). Approximate Picking Time (Summers): 05:00 (April 01 to September 30). Accompanied by: Excellent English Speaking Travel and Cultural Expert. Please note: You will be picked up from your centrally located hotel in Jaipur by your travel expert for Jaipur Night safari. He will be taking you to an extraordinary exploration around Jaipur in night. 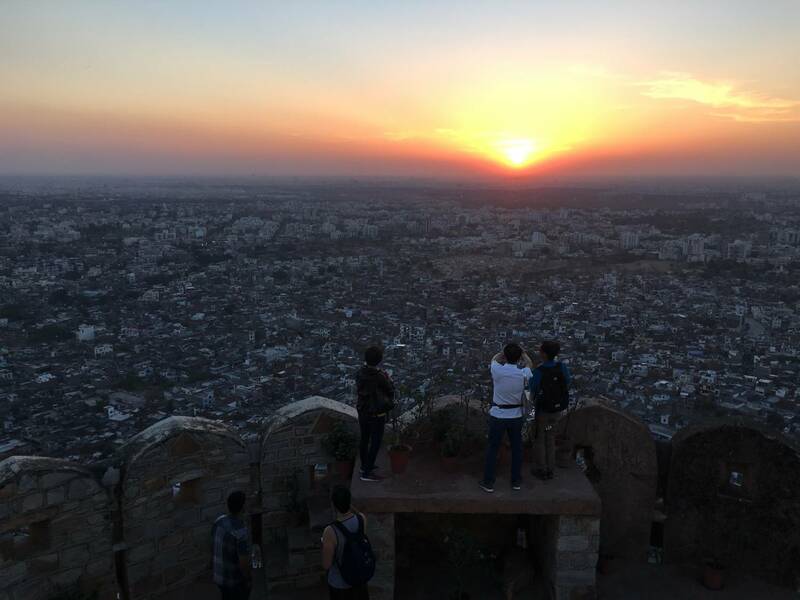 Nahargarh Fort: You will be taken you a vantage point for having an aerial view of the Jaipur city at Night. To reach the vantage point we need to drive through the beautiful forested hill. These hills are the places where 03 of the biggest forts are situated. These three forts are Amber Fort, Nahar Garh Fort, and Jai Garh Fort. The first destination will be Nahar Garh Fort. Here we will be stopping to have a drink (Paid directly by the guest) and enjoy the sunset point. This will be giving you the best view of the Jaipur especially during the time of Diwali Festival. 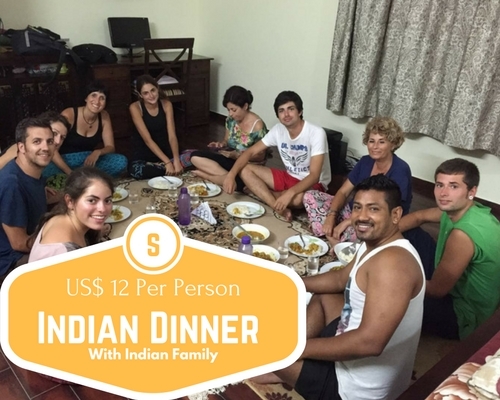 You may also click here to Celebrate Diwali with Indian Family. Nahargarh fort offers a breathtaking bird's eye view of illuminated Jaipur City during the Night tour of Jaipur. 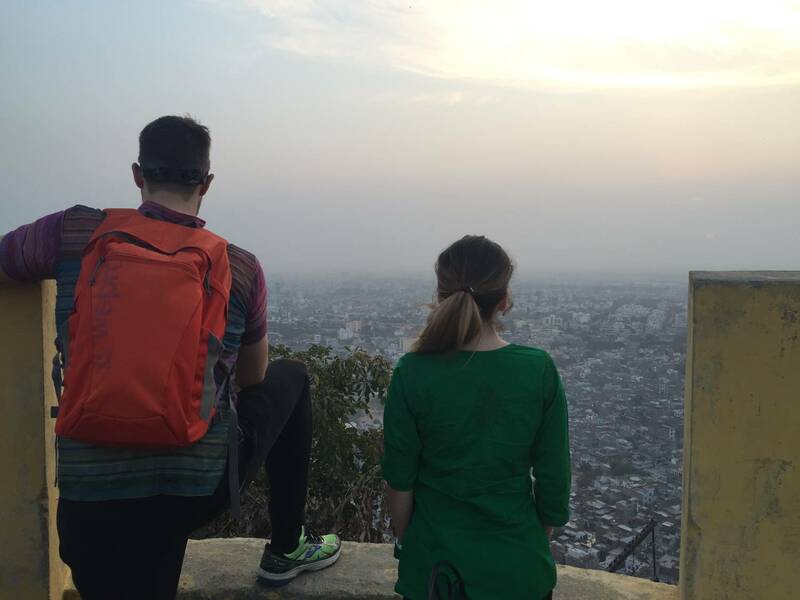 Relaxing here with the sunset view is one of the best moments that you can have while Traveling to India. Please carry a good jacket (winters – November, December, January and February) and raincoat in Monsoon (July and August). 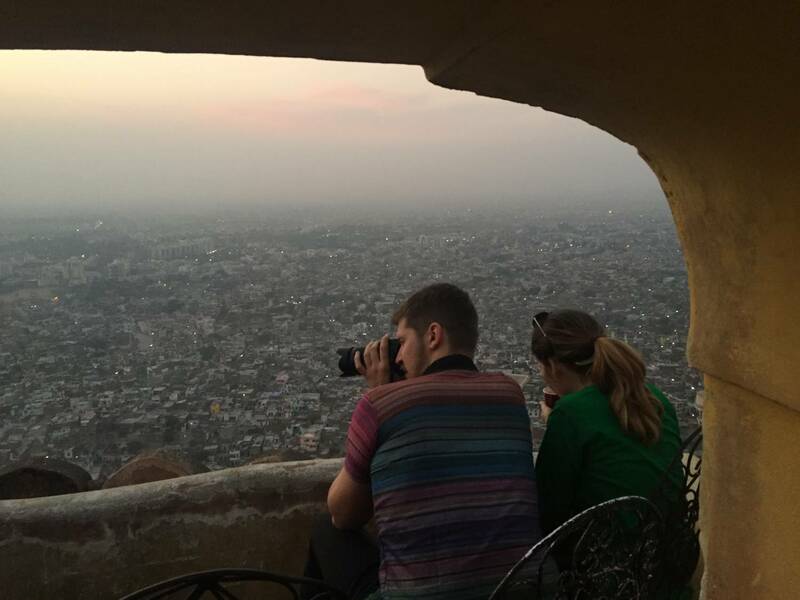 If you have binoculars would enhance your experience of Jaipur Night Tour. Amber Fort: Amber Fort to enjoy the beautiful night view of the fort from the outside. 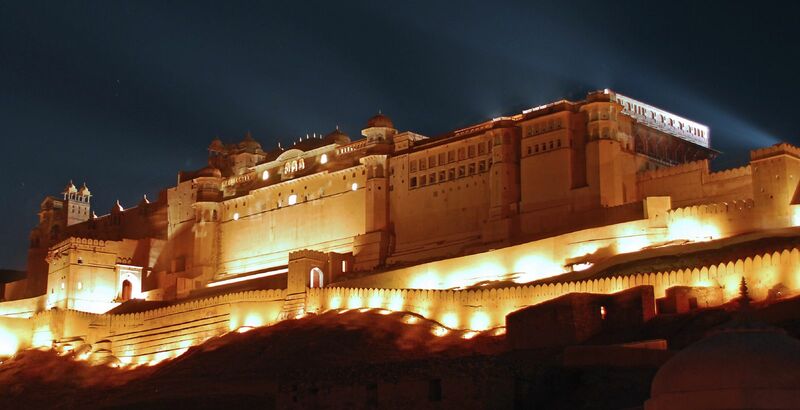 Amber fort offers a breathtaking play of lights on this majestic building. Located high on a hill Amer Fort's view is the principal tourist attractions in the Jaipur in Night. Jal Mahal (Water Palace): Later on we will drive towards the Water Palace with the beautiful view of the palace surrounded by water. Try to capture the wonderful moments with the camera. Jal mahal palace offers the beautiful reflection of lights in the crystal clear lake that surrounds it during the Jaipur night safari. Hawa Mahal (Wind Palace): After the palace, we will drive towards the Palace of Winds to experience the beautiful night view of the architecture. Hawa Mahal or Wind Palace is so named because it was essentially a high screen wall built so the women of the royal household could observe street festivals while remaining unseen from the outside world. Hawa Mahal offers a very beautiful view Night tour of Jaipur. Pink City Drive: During the complete Jaipur Night Safari we will be passing the area of old Streets of Jaipur including Jewellery Street, Small Cross Road, Big Cross Road along with some ancient buildings of Jaipur. Alber Hall Museum: Finally drive further into the city to see Albert Hall all lit up at night. 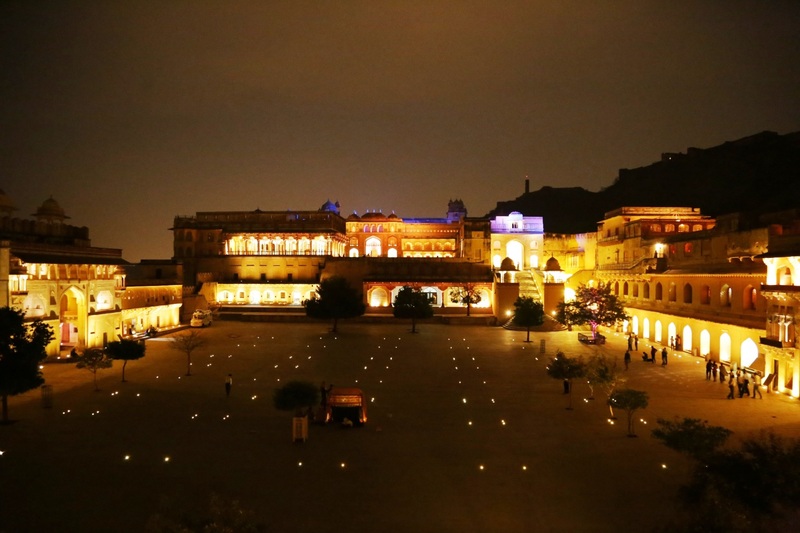 This tour will leave a long lasting memory of how truly beautiful Jaipur at Night. Once these sights will be visited the travel expert will drop you to your hotel. 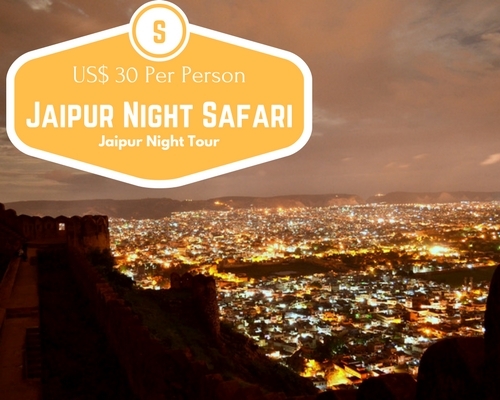 The Jaipur Night Safari - Night tour of Jaipur will be completed here. Inclusion to the Jaipur Night Safari! Round-trip transfers from your Jaipur hotel. Excellent English Speaking Travel and Cultural Expert. Please Note: The government controls the lighting on the monuments. We have no control on lighting on the monuments.